As it turns out, this is tricky business. In Kepler’s original 3-year mission, a true Earth analog around a Sun-like star would only have orbited 3 times. Complicating matters, Kepler’s precise photometry has shown us that other stars with the same mass as the Sun tend to be slightly more variable, on average, making it even harder to find planets. So we haven’t figured out eta-Earth yet. However, the census of planets for smaller stars—M dwarfs—is now basically complete. 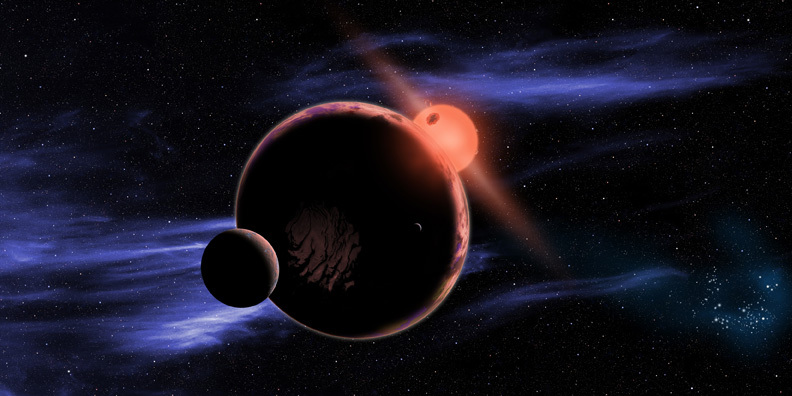 This is because, when finding transiting planets orbiting M dwarfs, we have several factors on our side. First, M dwarfs are small. This means that an Earth-sized planet crossing in front makes a deeper transit around an M dwarf than around a G dwarf like the Sun. Second, M dwarfs are much fainter (0.015 to 7.2% of the Sun’s luminosity) which means that the habitable-zone orbits closer to the star. A smaller orbit means that the planet crosses in front of the star much more frequently. Since Kepler finds small planets by phase-folding data (essentially adding the signal from all the observed transits together), observing ~5 times as many transits for each planet means that we’ve actually found most of the Earth-sized “habitable zone” planets transiting M dwarfs in the Kepler sample already. In this paper, Courtney Dressing (an astrobites alum!) and Dave Charbonneau use this M dwarf advantage to determine the occurrence rate of small planets around M dwarfs. Figure 1. (fig. 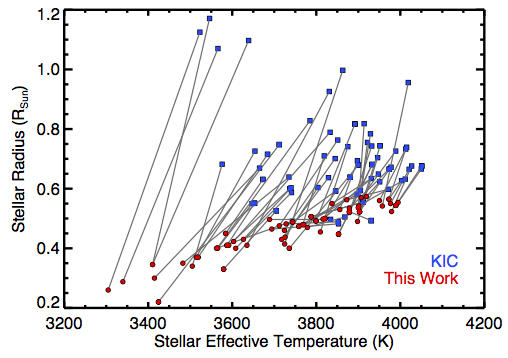 5 in original paper) The revised temperatures and radii of planet candidate hosting stars. Blue squares show the original Kepler Input Catalog values and red circles show the revised values from this work. They start by determining the stellar parameters for the stars in the sample. Originally, to create the Kepler Input Catalog (KIC), the Kepler team acquired photometry in seven bands. They then compared these to available stellar models at the time, which were most accurate for F, G, and K dwarfs. However, the models were not optimized for M dwarfs, so the KIC radius and temperature values for the M dwarfs in the Kepler sample are quite wrong in many cases. In this study, all of that original photometry was completely refit with modern state-of-the-art M dwarf models. 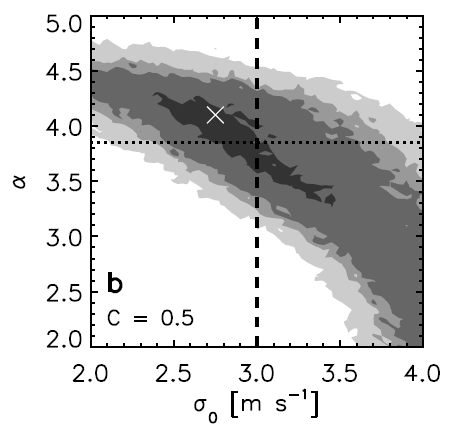 The resulting stellar parameters are significantly more accurate than those in the KIC, with most stellar radii shrinking in the new analysis (Figure 1 shows the KIC and revised stellar parameters). Armed with these new stellar parameters and all of the original Kepler light curves, Dressing calculated the sizes of all of the planet candidates around every M dwarf. During a transit, we measure the ratio of the radius of the planet to that of the star, so since most of the stars shrank, most of the planet radii also shrank. Figure 2 (fig. 16 in original paper) Occurrence rates of planets around M dwarfs for different orbital periods are shown. Planets in periods of less than 50 days are shown in black, less than 10 days in green, and 10-50 days in purple. Note the steep drop off at 2.8 radii-- there seem to be very few Neptune-Jupiter sized planets around M dwarfs! Having revised the planet properties, statistics about those planets could be calculated, accounting for the probability of detecting a transit given the geometry and completeness of the sample. The occurrence rate of planets with radii between 0.5 and 4 Earth radii and periods shorter than 50 days is found to be 0.86 planets per M dwarf: a planet for almost every M dwarf in the galaxy! 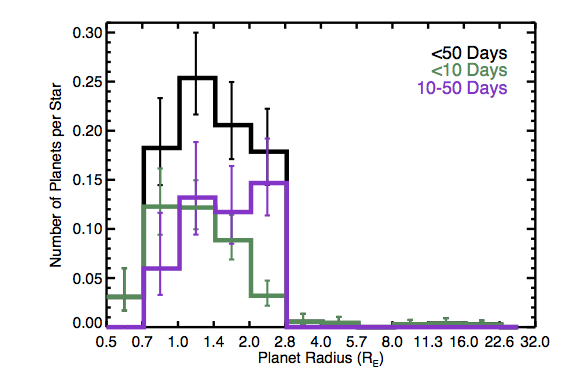 Figure 2 shows the planet occurrence rate around M dwarfs as a function of planet radius and orbital period. There’s a steep drop off at 2.8 radii, showing us that Neptune to Jupiter sized planets in less than 50 day periods around M dwarfs are very rare. Also note that for planets smaller than 0.7 Earth radii, the sample is not complete (there may be more tiny planets we haven’t found yet). Even more exciting, they break down the occurrence rate for Earth-sized planets in the habitable zone and find that there are 0.06 such planets per M dwarf. Given the M dwarfs in the solar neighborhood (12 times as many as Sun-like G dwarfs! ), there should be a transiting Earth-size planet in the habitable zone of a cool star within 29 parsecs; the nearest non-transiting Earth-size planet in the habitable zone should be within 7 parsecs (23 light years)! Great work, Courtney, and a lovely write-up, Caroline! I can’t wait for the community to find these nearby Earth-size planets in the habitable zone. These planets are more abundant than I dared to dream.